Our Naples Personal Injury Attorneys have represented hundreds of people that have been injured in both Naples, Florida and throughout the state by no fault of their own. Our lawyers are available by appointment to meet with you at our Naples office, your home, the hospital or at a location that is most convenient for you. In 95% of the Naples, Florida accident cases that we handle our accident attorneys can tell you within a matter of minutes whether you have case. The best way to know if you have a case is to call us for a free phone consultation. Whether you are a Naples resident or were injured in Naples, our attorneys are available to discuss your recent accident. 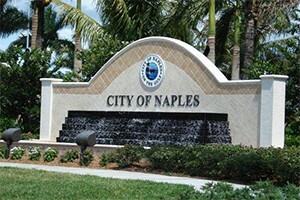 Naples, Florida is the affluent city on the Gulf Coast of Florida. The city has a rich history and cultural heritage, not to mention miles of white sand beaches which make the city a desirable place to live and visit. There are several large companies in the downtown area such as ASG. Many residents commute daily on U.S. Route 41 and Interstate 75. This large volume of drivers often causes slowdowns and traffic accidents on the busy roads. Naples has over ten miles of pristine white sand beaches and many championship golf courses. Additionally, the year round tropical climate allows residents to enjoy a variety of outdoor activities, including swimming, fishing, boating and bicycling. At times, these activities can be dangerous and accidents do occur. As such, there are many hospitals to serve the population, including NCH Healthcare System and Pointe Medical Center. The plaintiff, a 25 year old electrician, was broadsided by the defendant, causing his SUV to flip on its side. The plaintiff suffered a cervical fracture and wore a hard cervical collar for 8 weeks. The plaintiff recovered without the need for surgery. The plaintiff incurred $20,000 in medical bills and suffered a $9,000 wage loss. Case settled without the need to file a lawsuit for policy limits of $150,000. Our client was a husband and father of two minor boys when he died in an automobile accident as the result of the negligence of a commercial truck driver. The trucking company claimed that the decedent failed to use due care and was speeding. Prior to filing a lawsuit we were able to obtain the maximum policy limits of $1,000,000 for our client’s family.